There’s no future. I don’t mean this as a grim forecast. I mean this as the way things are. Yesterday I noticed how strong and real my expectations for the outcome of the election have been, before suddenly everything went the other way. I had been anticipating with some satisfaction how I would savor and perhaps even gloat gently to myself, and perhaps with others… that my world view was shared and had prevailed by a landslide. Instead I got an outcome that I was in no way prepared for. I found myself frozen, awash in anxiety, with black and white images of bombed out cities from WWII playing inside my head whenever I closed my eyes. Mean and dangerous people in uniforms were walking among the rubble. Fear and hopelessness. Nothing much I could do about it. When I got up this morning (I would say, woke up, but that would imply that I slept), I had to get to a class, assuming that schools still existed, so I got myself dressed. When I went out, the sun was up. That was encouraging. I looked around at the gulls by the lake and felt blessed by them. I hoped that their ecosystem would survive climate-change denial. I also noticed that I was really fond of the people around me. I felt a lot of love and appreciation, like after a natural disaster. The day was full of conversations with people, questions, dismay, incomprehension, but also just what passes between people, something like comfort. There’s a mystery here. While I believe that there is a future, and I plan for it, and dread it, or anticipate it with pleasure, it’s not actually real. While it’s convenient to think of linear time, past present future, as real, and our minds are set up to understand things that way, there’s really no future. 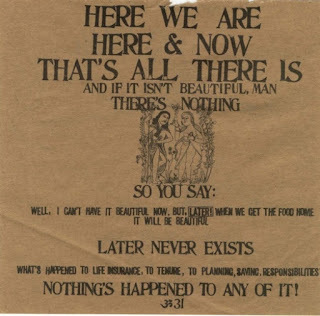 There’s only ever now. And even if I’m afraid or sad, I always know what to do. I put one foot in front of the other. Even if I’m frozen, that’s my life at that moment. I’ve stopped, I’m waiting, to see what appears. What I’m noticing, time after time, is that when I stop wishing I could feel some other way than this, I can trust myself, trust us all. I will thrive where I’m planted. I will see my way through, like we humans do. And when I pay attention to it, I can tell how much I care about my fellow humans. Sadness and disappointment bring me back down to the place I’m standing. When I stop telling myself stories about a mythical future, I can have confidence in this time, this place, these companions. And I can even start to feel hopeful, that the future will be much like the present, something I can handle, something I can love. And that’s not to say there isn’t work to be done, stands to be taken, and something internal that I need to be loyal to. It doesn’t try to overlook how, for every person, there are things that are required that we really have no idea how to do, it’s just that they will be done, and we are enough. How is it for you right now? And how does it change if you don’t think you should be feeling something different?